The “ad” for GTA V’s new lowrider variant of the Sabre Turbo looks pretty familiar. They’ve been making these ads for their lowriders for a while now. The one for the Faction donk was in the same style as classic VW ads, but those are obviously two very different vehicles. Recently, though, they seem to be mimicking real ad campaigns even more closely. When I saw the one for the Vapid Minivan, I read it in Edward Herrmann’s voice. 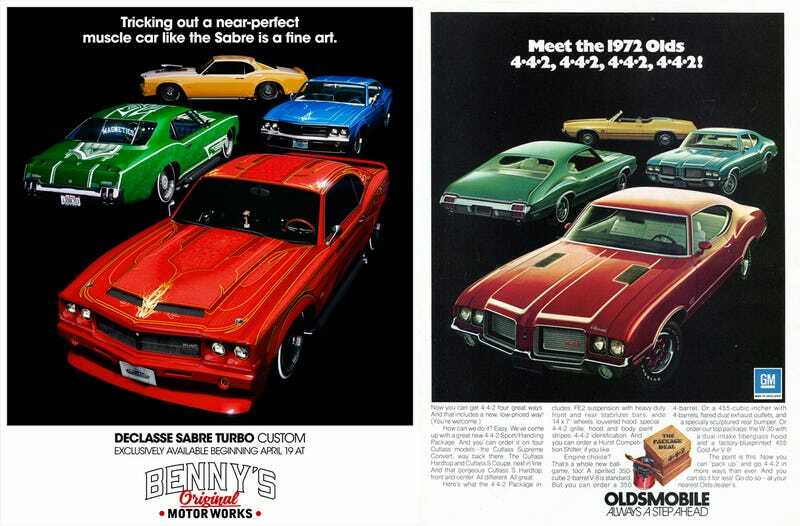 You might notice that this latest one for the Sabre uses quite a different font than the Oldsmobile one does. That font or ones like it were common in other car ads in the early ‘70s, including Plymouth and Chrysler ads and the brochure for the Buick GSX, a car which I think the Sabre also gets inspiration from.